Item collector isn't creating profiles for my characters on the Agnarr server. My characters on the Luclin server all have profiles, just not the Agnarr ones. Is it giving the same error message for the characters on Agnarr? We just pushed out some changes to the script that handles items coming in from the item collector. The servers have been updated to the latest. Please test this out and let us know if you are still having the same issue. I just tested the upload for characters on Agnarr. I was able to upload my character on Agnarr. IC is crashing while looking at merchants items. We're aware of it and are working on it. Edit: This has been fixed by Rswiders. Crashing upon zone into LDoN Everfrost theme zones has been fixed. The Item Collector is updated for the 2-21-2018 patch. Item Collector updated for 2-22-2018 patch. Nevermind - I ran it as administrator and now it's working. Item Collector updated for 3-14-2018 patch. Item Collector patched again to correct an issue with it, please close down your item collector and open it again for it to download the new update. It appears to me that when you click an item link that has augments, the main item is catalogued and dispensed with but not necessarily the augments in the slots themselves. Server is requesting 1 items. Note the 3 augments I highlighted in the list above that implies that my EQIC had not either seen them or these were updated augments and your server came back and said, "No, we've seen these already," (via the Server did not request any items response). Also, the new programmer had changed EQIC so that once you've linked an item and it has been itemized/resolved, it will never display it in EQIC's information window again, no matter how many times you click that link. 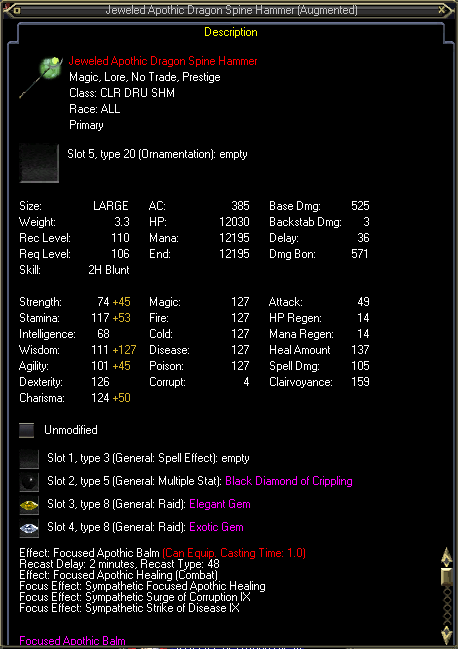 As such, this is telling me, that my EQIC saw the Jeweled Apothic Dragon Spine Hammer and once it talked to Lucy, Lucy said to send the item stats to her but my EQIC did NOT see the augments embedded within and only did so when I linked them back to myself and clicked them which EQIC then passed the item information query onto Lucy. Potentially, this means you are not getting updated augment stats in the slots of a linked item on some items, not necessarilly all items. Regardless that Lucy did not need to update those augments, it's that my EQIC did not see them initially when I clicked the Jeweled Apothic Dragon Spine Hammer link. Thanks for the detailed post Byren. Right now the IC doesn't read items within items either from scanning inventory or from opening up an item link as you have pointed out. Maybe Rswiders (item collector dev) might work on that in the future. It will display, if the stats in your local db change because the item changes. Each item has a crc32 value computed and ONLY if that value changes does it show up again. If it is the same, then nothing needs to be sent to the server and to reduce net traffic the program has always checked to see if the value changes before sending it. Yes sir, I didn't mean to imply that it would never (never ever? nevah evah! :) ) display the link in EQIC when it has been changed in the wild (roaming loose in EQ). Rather, that if it has seen and catalogued the current version of that item, then it will no longer display it in the EQIC window whenever you click the link. Previous iterations would show the link's ID # etc. for every link you clicked, which I had used to compare items that I had on other toons to see if I got: One of these items may not be like the other because they were visually identical but the item lore was different. I can use /outputfile to gather the relevant item IDs to cross-compare. Now that I know that augments in slots aren't catalogued at the moment, I'll ensure to link them so that EQIC has a chance to stay current with any updated augments. STILL requiring manual install of wincap for Win10. Just a heads up, the item collector is in development at the moment. There were some changes to how the EQ client communicates with servers so some additions will need to be made in order for the item collector to work properly. No ETA on it right now but might take a while. Thanks for the heads up Gidono. Thank Gidono! I guess this is why I can not get a profile to upload off of Ragefire? Correct. Once we get the item collector updated, we'll let everyone know. All profiles will need to be rebuilt. The program will now automatically delete them all with this update. IC patched for 4-18-2018 patch.